Kerosene 454 were a fantastic quartet out of Washington, DC. I’m pretty sure I have a tape somewhere around here with a soundboard recording of a show they played at NYU in 1997. Maybe not. Either way, they were a tremendous band who don’t get talked about nearly as much as they should. (Fun facts: the guy who wrote their bio on AllMusic would go on to co-found Kickstarter.) 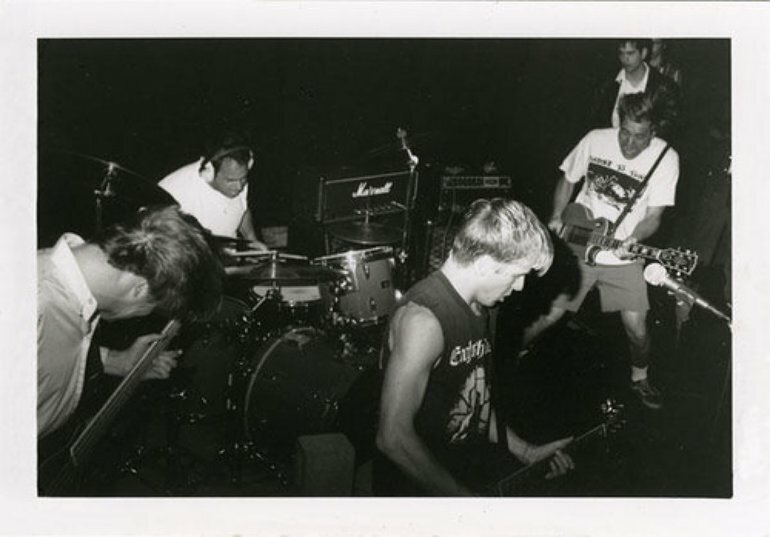 As a bonus, bassist John Wall was also one of the folks behind the excellent label Slowdime, who released plenty of music that challenged expectations about what punk-rooted DC music could sound like. Also, please note young me’s awkward attempts to summarize the DC punk sound. “[T]here’s something in the music that sort of identifies some bands as being from DC.” You could have phrased that better, young me. After this interview, the band would release one more album, At Zero, before calling it a day. Members went on to play in groups like Oswego and Office of Future Plans. This interview first appeared in the third issue of Eventide. As far as bands from the Washington, DC area go, Kerosene 454 are one of the best. They have released two full-length albums and a score of seven inches, and have also toured quite a lot. Live, they are one of the most intense bands out there, period. This interview was done over the phone before they left on tour with the Blue Tip. Can you say your name, what you do in the band, and what the lineup is? My name’s John Wall, and I play bass. There’s Darren Zentek, he plays drums; Jim Wall’s on guitar and does some backing vocals, and Erik Denno plays guitar and does most of the singing. How long have you guys been together for? Three and a half years, I think. How’d you guys get together? My brother and I started playing together out in Los Angeles. We met up with Erik in Arizona, and he happens to be from DC. We just said, “Let’s move back east”, because there are some better school back here and what-have-you. Being able to play music is a lot easier. On the East Coast, cities are a lot closer; there seems to be more of a scene. We just came out here, and met up with Darren, who was playing with Glendale at the time. They broke up, and he said that he wanted to come out and play. He joined the band, and we went from there. That’s when we went and recorded our first record. The one on Art Monk Construction? Are you from LA originally? My brother and I are from Arizona originally. It’s the same with a lot of people who are in this town, like Juan Carrera from the Warmers. Alex Dunham from Hoover’s from Arizona. Were you at all involved with the Arizona scene? We used to play in a band-my brother and I, Al Dunham, and Eric Astor, who runs Art Monk Construction. It was called Wind of Change, back in ‘88, ‘89. Would you consider yourselves part of the scene in Washington now? Because there are certain characteristics that some of the bands seem to share… I mean, there’s something in the music that sort of identifies some bands as being from DC. What would you say is, if anything, a shared characteristic of the bands in DC? John: At this time, it’s tough. There are so many different styles of music. Not totally different styles, but you have the Make Up, for instance, Trans Am….but there’s even some similarities there, to Fugazi, to the Most Secret Method, to something like us, to Blue Tip, to Lungfish, to… There’s definitely a similarity in the guitar playing, maybe. The way the guitar sounds…a lot of this music’s recorded at Inner Ear. There’s some similarity there. I guess it’s mostly in the guitars; that’s about as much as I can think of. You guys toured with Blue Tip, right? Oh, it was great. We toured the US for two months. We’re also going to be touring Europe this fall for two months. I know that you have the two full-lengths and the split seven inch with Blue Tip; what else do you have out? We have three seven inches on our own. We did a split seven inch with Angel Hair, and then another split with Blue Tip, so that’s five singles, two splits. Then there’s Situation at Hand, on LP and CD, and then Came by to Kill Me, LP, CD, whatever. And then, since Situation at Hand went out of press, we decided to keep it in press, so we asked our friend at Polyvinyl if he would do it, with all of the seven inches on it and an extra song or two from this demo tape that we had. And he put it out. So Polyvinyl now has our first record with all of the other material. How did you get Came by to Kill Me released on Dischord? Talking to Ian. He was into the whole Slowdime idea; he wanted to have an offshoot-type label coming out of DC, and that’s what Slowdime became. At the moment, Juan Carrera and myself. Two Regulator Watts seven inches and an EP, the Metamatics LP, Kerosene 454 LP/CD, and on August 11, there will be a Regulator Watts LP/CD and an All Scars LP. So we’ve got two records coming out. It’s become a full label with Dischord. I mean, it’s within the same house. How satisfied are you with Came by to Kill Me? We’re all really happy with it. How did you pick the title? (laughs) I guess none of us really picked it. We couldn’t think of anything; our friend who did the artwork came up with it. he put his artwork together, and that’s what came into his mind. He put it all together for us and showed us, and we said, “Okay, sounds good”. Who writes the lyrics, primarily? Erik Denno. Whoever is doing any singing is the one who writes the lyrics. Do you have any plans to record anything else in the near future? In the middle of August, we’re going back into the studio. John: Possibly. We’re trying to put another record together before we go to Europe. What do you do outside of the band? Jim is a photography assistant. Darren works at Chuck Levin’s, with the drum department. I work at the University of Maryland. I do physiology, clinical psychology research. I work at a sleep disorder center, and I help run Slowdime. And Erik works at a museum, and at the Black Cat. We’re all pretty busy. How long do you see Kerosene 454 staying together? I don’t know. As long as we all keep on rollin’ and having a good time. Would you say that it’s gone pretty well so far? Oh yeah. I mean, it keeps on getting better. If it ever comes to a point where there’s no fun in it, at that point we’ll definitely consider what we’re doing. When you’ve toured, where have you found that people are most into your music? All over. For the most part, shows were really good, throughout most of the country. I mean, there’s a spot here and there where people don’t know anything about us. I guess that’s about it-is there anything that you’d like to say in closing? (pauses) There’s a lot of good stuff going on in DC right now. There’s a lot of good bands and a lot of people working really hard, that do good stuff-musically and artistically. Toby: What bands from DC are you into right now? John: A lot of ‘em. Anything from the Most Secret Method, Warmers, Blue Tip, Make Up, Trans Am, Cold Cold Hearts, Regulator Watts, of course, a band called the Boom with Fred from Hoover. Those guys are great. Also, the Sorts, also from DC. Have you heard of them? It sounds familiar, but I can’t place it. I listed what-ten bands? There’s a lot going on. A lot of bands in the underground scene are out touring and working hard. Exactly. That’s what I’m trying to say. There was a lull at one time, when there wasn’t a lot going on. Now, there’s a lot going on. What first got you into the type of music that you’re playing? Punk rock. Being a little kid and seeing… I saw a Fear show when I was a little kid. It lit me out. I thought it was amazing. Fear, Circle Jerks, Bad Religion, bands like that. Getting a Minor Threat record. Black Flag, all that stuff. That’s what pulled me into it. Are there any bands out there that you’re looking forward to playing with? Blue Tip, Regulator Watts, the Boom. Also, J. Robbins has got a new band. I don’t know the name of them yet, but I’m going to work on getting a couple of shows with them, possibly. Regulator Watts did a show at NYU a few months ago that did really well-it was them and Ink & Dagger and T Tauri and the Carson Co-Op. How long have you been doing this zine? A year and a half; this is going to be the third issue. Oh, right on. Thanks a lot. Thank you. Are you guys coming through Jersey any time soon? We’ll be coming to New Brunswick on the last Sunday in August. Possibly New York City at some point, but definitely New Brunswick, and Philadelphia. It’ll be the same weekend, with Blue Tip. Come check it out.